Radiohead played their fourth show of their 2012 fall Euro tour tonight in Paris, FRANCE at the Palais Omnisports de Paris-Bercy, an indoor sports arena and concert hall on boulevard de Bercy located in the 12th arrondissement of Paris. 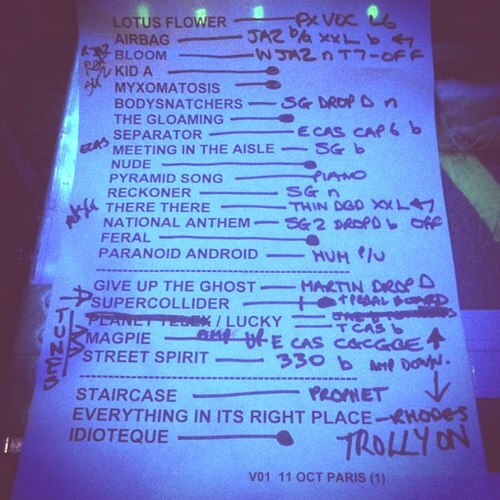 We’ve got the full setlist and a few fan tweets from the City of Light down below. The band returns for a second night at the Palais tomorrow night for another sold out show. Stay tuned for videos from the show. I love you and I can't wait to see you and Radiohead in a couple of hours. Ps: Yes, I am in fact obsessed with Radiohead.